January 25th is a special day in Wales - it is the Welsh equivalent to Valentines Day. There are a few versions of her story, as many many folk tales from Wales were passed down generations verbally but the gist goes something like this. Depending on what version you read Brycheiniog had anything between 24 and 60 daughters! 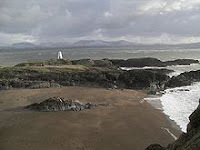 The legend goes that Dwynwen fell in love with a prince called Maelon, but her father refused to let her marry him. She was very upset and asked God to help her to forget her prince. An angel came to her in a dream and turned Maelon into ice. Dwynwen was then granted three wishes and she cleverly wished that Maelon be thawed, that God meet the hopes and dreams of true love and finally that she would never marry. As these three wishes were granted Dwynwen devoted herself to God for the rest of her life. 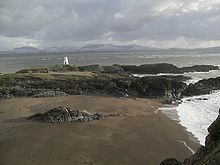 The remains of the church that Dwynwen built can be found in Llanddwyn, a small island off the west coast of Anglesey. Many marriage proposals take place here - I wonder who's there tonight?